I can count how many times it has rained over the past year on one hand. If you think of California (especially if you have never been here), you probably think of gorgeous beaches, surfing, redwood forests, and sprawling cities where the sun always shines. However, if you move away from the coast down into the valleys you will find some of the most eerily beautiful (and also very, very ugly) dry landscape: brown hills covered with tufts of green, miles and miles of cattle land, and deltas where the small amount of water collected during the winter months is pushed down to the south of the country. During the winter and spring of 2016-2017 we averaged just below 28 inches of precipitation, which made it the wettest winter in over 100 years. There were floods, snow dumps in the Sierra Mountains, and there was also the imminent threat of a dam bursting open (it was thankfully avoided). It was only my second winter living in the state, so I just assumed it was normal, and embraced the fact that we were finally getting the rain that was much needed. For 5 years before that winter California was in the middle of a 5 year state of drought. We really go for months and months without a drop of rain, and that’s quite normal for this climate. But when it starts to spread into the next year and the year after you can only imagine how dry the ground is, and how vulnerable the undergrowth and overgrowth is. While the heavy rainfalls we had in 2017 ended the 5 year drought, it didn’t mean that we were out of the woods. California earthquake risks are well-known worldwide, but the risk of wildfires is actually much, much higher. And when drought is followed by a lot of rain, and then followed by another year of drought, the ground is extremely vulnerable to mega wildfires. This PBS article explains it in-depth: no amount of raking is going to stop the long-term effects of climate change on our land. On Thursday November 8th, I was walking home from the grocery shop with my youngest and there was quite the wind blowing, something that is pretty infrequent here. Honestly most of the days are similar: very, very hot in the summer, and cool at night, but in the 70’s in the day the rest of the time, with rain here and there. Blue sky and sunshine are what you usually wake up to, and clouds are pretty rare a lot of the time too. On that Thursday the wind smelt of foreboding, and it wasn’t long before I heard about the fire just 80 or so miles north of us, wiping out one of my close friend’s hometown, Paradise, so fast that most people left with just the clothes on their backs, if they were actually lucky enough to get out. It has taken firefighters over two weeks to contain the fire, and the number of fatalities continues to grow, while those missing are logged at just under 1,000. This fire is known as the Camp Fire. On the same day another fire started in Malibu, destroying structures and ripping through the hills, fueled by the strong Santa Ana winds and the dry landscape. The Woolsey Fire also took firefighters nearly two weeks to contain and destroyed residences, businesses and tens of thousands of acres of land. 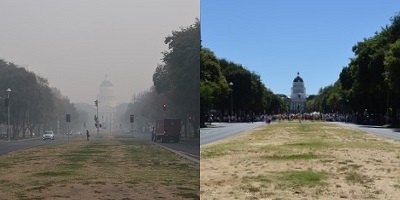 During those two weeks California was literally on fire, north and south. Fortunately for me and my family, we live 85 miles south of Paradise, and nowhere near the line of fire. 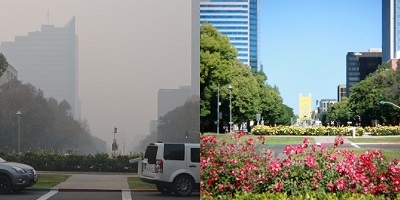 However, for two weeks the city we live in was literally engulfed in smoke from the Camp Fire. Weather conditions (low winds and the usual large temperature difference between day and night) pushed the smoke into the city area and kept it there, wildfire particles hovering near the ground, and immediately breathed into our lungs. This isn’t the first time this has happened while I have been here, we usually get a few days of bad air quality whenever there is a wildfire within a few hundred miles, but this continued on for two weeks. The air hovered between “Very Unhealthy” and “Hazardous” and local fire stations gave out N95 masks to wear for anyone interested. I don’t know whether you have ever tried to keep a mask on a 16 month old, but if you have you know that it is practically impossible. I kept the kids home as much as possible, especially as they had already been under the weather with a seasonal cold. Because the air was so bad for so long they all developed ongoing coughs, and I do worry about how much damage the air may have caused to their growing lungs. It rained a few days ago, and the sight of the drops falling from the sky brought so much relief. The following day the air was crisp and light, and pushing the double stroller up the hill felt easy and achievable again. Of course, the rain now brings other worries, such as landslides, and also, the potential disappearance of human remains in Paradise, washed away with the burnt soil. Despite callous comments from the current US administration about how we could have easily avoided these fires (get raking people! ), our main efforts should be focused on climate change. The longer the droughts, the bigger the fires, and the more damage, to human life, animal life, and nature in general will occur. I refuse to believe that our children will have to grow up wearing masks and suffering from chronic breathing and lung conditions. I wrote a poem about it, for those interested.